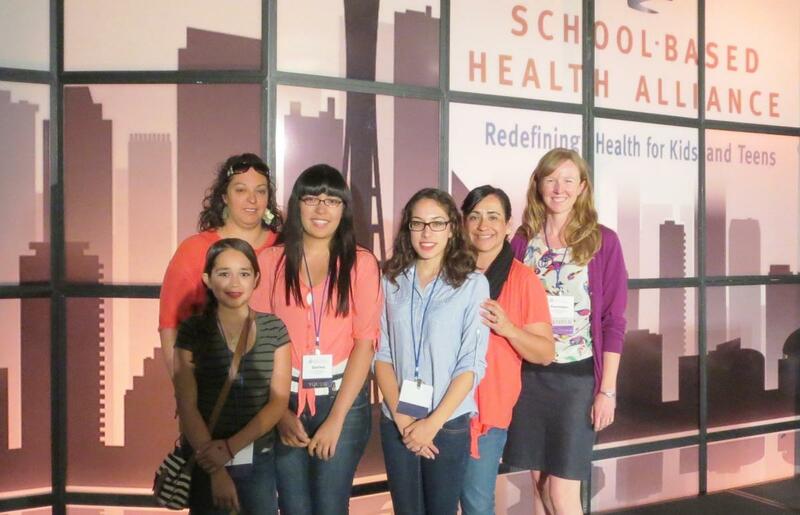 Staff members and program participants of the Santa Cruz County Adolescent Wellness Network attending the 2014 School-Based Health Alliance conference in Seattle. To promote adolescent wellness through advocacy, education and collaboration with youth, schools, and community organizations serving youth, ages 12-25. To be the collaborative voice and catalyst for adolescent wellness in Santa Cruz County. Cassalyn David, network director of the Santa Cruz County Adolescent Wellness Network, was interviewed by NCHN’s director of member services to share information on the network’s characteristics, key learnings, accomplishments, and challenges. A: The Santa Cruz County Adolescent Wellness Network (AWN) is a group of local agencies that has been working to promote and improve adolescent wellness services through collaboration, education, and advocacy since 2007. The current partner organizations are Mariposa Community Health Center, the lead and fiscal agent, along with Southeast Arizona Area Health Education Center (SEAHEC), Santa Cruz County School Superintendent, Community Health Associates, Pinal Hispanic Council, Circles of Peace, and the University of Arizona Cooperative Extension Santa Cruz County. The AWN is a place for partners to collaborate and share resources to identify and respond to adolescent wellness needs. The network is a collaborative, dynamic group of really key organizations in our county that serve adolescents. It creates a space that wouldn’t otherwise exist to address health issues that reach across silos. A: Partners are able to provide services and make connections they would not otherwise be able to make. The adolescent health issues that we are addressing are rooted in social determinates of health, and we can only make an impact when we partner effectively with youth and change the systems and environment. We currently have a diverse membership, and we are always open to new members. We have representation from behavioral health, but more behavioral health members would be helpful because we know that’s a huge need for the adolescent population. Two of the most surprising things so far have been the gaps in communication between organizations and how easy it was to start conversations and collaborate. Q: What’s unique about working in your rural area? A: The border location of Santa Cruz County creates unique challenges with which the network must contend. One of these is immigration concerns. The local community lives its life on both sides of the border, crossing back and forth for work, education, family, and health care. This adds multiple layers of complexity to eligibility for services, continuity of care, and care coordination. Organizationally, it is very important for the network to know what is taking place in Mexico, and AWN continues to develop relationships with key organizations across the border. Our partner organizations have such limited time and resources. Partners understand the value of the network and therefore devote a significant amount of time to this collaboration. It’s easy to have your target area and population. It’s easier to connect with key players in the community because everyone knows each other. All of this helps demonstrate the need for the network because of the network’s ability to meet these unique difficulties that have not and are not being addressed by anyone else. A: One major goal and huge win for the network was overcoming the difficult challenge of improving the referral process between schools and primary care providers. These two systems were completely separate and very different. They each were also working with limited resources. Because of the relationships that had been built and the collaborative nature the network fosters, AWN was able to design a direct referral process. With time and patience and having quality people championing for this change, we have created a lasting and sustainable referral system with the potential for expansion. A: Become an NCHN member. Use the technical assistance available as a grantee. And, don’t be discouraged if people have trouble understanding what a rural health network is.